Founded in 1960, the National Gandhi Museum is managed by the Gandhi Smarak Sangrahalaya Samiti. The purpose of the museum is to create awareness for the work and life of Mahatma Gandhi, India’s Father of the Nation. This is done through photographs, paintings, manuscripts and the worldly possessions of the Mahatma. The museum has galleries that showcase his life, his efforts in India’s freedom struggle using artwork and relics. The well maintained library has about 40,000 books, magazines and Gandhiji’s writings on world peace and his views on religion. 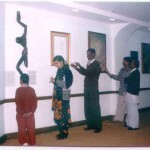 Galleries – There are various galleries in the museum including the entrance gallery, photographic gallery, commemorative gallery, martyrdom gallery, art gallery, ashram gallery, spinning wheel gallery and other displays. – Three Monkeys on Woodcut. – Quotations like India my Dreams, Seven Social Sins, Talisman. 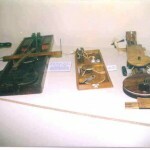 – Hand telephones on which Gandhiji’s speeches can be heard in his voice in Hindi and English. – 285 photographs divided into 10 phases from childhood to arrival in Delhi. – Walking stick that was used in the famous Dandi March. – Personal belongings of the Mahatma like rosary, sandals, pens and more. 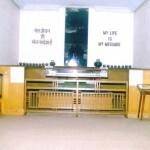 – Replica of Gandhiji’s room. – Medals presented to Gandhiji like the silver medal presented for organizing Medical Corps in the Boer War and Zulu Rebellion in South Africa. – First day covers issued by various countries on Gandhiji. – Copy of the letter written to the Mahatma by Gurudev Tagore. – Clothes worn by Gandhiji when he was assassinated. – Newspaper clippings related to Gandhiji and his life. – “My Life is My Message” on a wall size photograph. – 40 selected paintings, sculptures, pieces of art, groundnut shells and metal wire artifacts. – The eleven vows of Gandhiji. – Write ups on the various ashrams. – 23 models of spinning wheels including traditional ones and mechanized versions too. 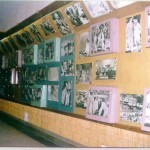 Other displays – Full scale replica of ‘Hridya Kunj’ in Sabarmati Ashram. – Large model in cement of Nandlal Bose’s lino cut of the Mahatma based on Rabindranath Tagore’s ‘ekla chalo re’. Library – The library has a catalogue of 26,000 titles on Mahatma Gandhi and the freedom struggle in India, captions of 6000 photographs, 1600 book titles, cards, CD’s, posters and recorded speeches. The library membership can be obtained by depositing a nominal security amount. Photo Section – This section contains a collection of photos of Mahatma Gandhi and Kasturba along with those of the Freedom Struggle. 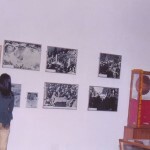 There are photos that have been categorized as the Early Phase, the South Africa Phase, the Sabarmati Phase, the Sevagram Phase, the Last Phase, Kasturba Gandhi and other family members, Other Photos, Other Leaders of the Freedom Movement and photos concerning the museum too. This section also has a photo developing and enlarging unit. Audio Visual Section – The audio visual section contains audio visual tapes including post prayer speeches by Mahatma Gandhi, tributes, patriotic songs and hymns, and speeches by other leaders of the Freedom Struggle. There are also 137 films on Mahatma Gandhi. 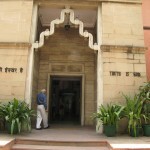 Gandhi Literature Center – The GLC or the Gandhi Literature Center is the sales center for literature and audio and video tapes. It has over 1400 titles. Other items that can be bought here include key rings, picture cards, pens and figurines. Special Exhibitions – A film show is put up every Saturday and Sunday from 4.00pm to 5.00pm. You can also request a screening. There is a special exhibition between 2nd October – 30th November and again between 30th January – 31st March every year. Timing – While the museum complex is open from 9.30am to 5.30pm on all days except Monday and national holidays, the library is open from 10.00am to 5pm. It is also closed on every 2nd Sunday of each month. Decorum – Visitors are expected to speak softly in the museum. Rowdy behavior is looked down upon. It is also expected that you will not make any politically negative remarks about the Mahatma and the Freedom Struggle. Delhi Metro Closest Metro Station to National Gandhi Museum is Chandni Chowk on the Yellow Line For fare and exact route check the Delhi Metro Rail Map. She Cabs – 45628200 Initial fare of INR 27 for the first kilometer; followed by INR 20 per kilometer. Waiting charges INR 2 per minute. Tuk-Tuk The easiest option to take if you are in Central Delhi Rates are based on the auto meter but often they do not work and you may need to bargain. It is a good idea to ask whether the meter is working or not before you sit in. 1948 – Mahatma Gandhi’s was assassinated on January 30, 1948. Post the incident, various collectors started to search for items associated with the Mahatma, his life and his work. 1951 – Mahatma Gandhis items were collected and taken to Mumbai. Later, they were transferred to buildings near the Kota House in New Delhi. 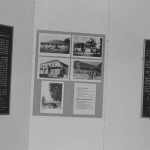 1957 – The Museum moved to a mansion close to the Kota house. 1959 – The artifacts belonging to Mahatma and items associated with his life and the freedom struggle were moved to the current Rajghat, New Delhi location. 1961 – The museum was open to the public by Dr. Rajendra Prasad, the first President of India on the 13th anniversary of the Mahatma’s assassination.